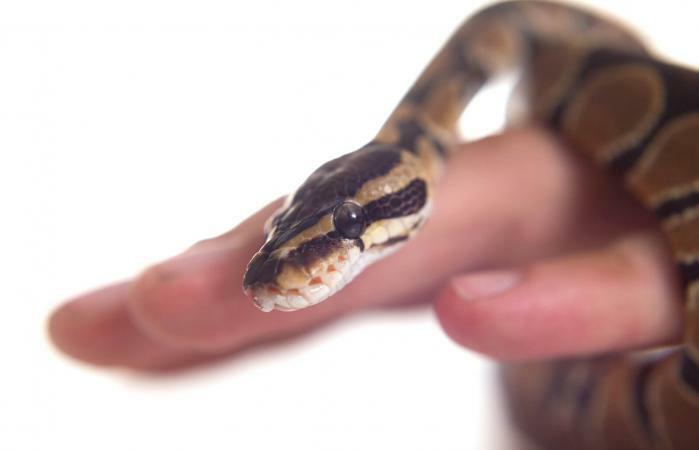 Keeping pythons as pets is easier than most people think. Find out why ball pythons are good pets for first-time snake owners and what you can expect when owning one. Ball pythons, also known as royal pythons or pythons regius, are in the same snake family as boas. All of these snakes are constrictors. Constrictor snakes wrap their body around their prey until the creature suffocates, and then they swallow it whole. Ball pythons are fairly small, and the typically reach only 36 to 48 inches long in adulthood. Pet stores that specialize in snakes will either have ball pythons on hand to purchase, or they may help you find a breeder. How Long Do Ball Pythons Live in Captivity? The ball python lifespan is about 30 years although they've been known to live up to 40 years. How they're cared for will greatly affect their lifespan. Many people enjoy owning a ball python as their first pet snake because it is easy to handle. The more you handle and hold your ball python, the tamer it will become as it grows used to your touch. It is a good idea to bring your snake out once per day to interact. They require very little maintenance as compared to caring for a dog or a cat. Ball pythons are reasonably easy to care for. Following are some tips for setting up and taking care of ball pythons as pets. A 30-gallon glass aquarium makes a decent habitat for a snake. Make sure it has a secure lid with ventilation. Pet stores make screen lids specifically for reptile aquariums. Cover the bottom of the cage with a substrate such as newspaper, AstroTurf for reptiles, orchid bark or moss. Some people like to use aspen or pine shavings for substrate, but these can both make the environment a bit too dry for your pet's comfort. Ball pythons eat either mice or small rats. Usually, these meals are live, but sometimes you can train your ball python to eat a frozen (thawed out) mouse. Whatever you decide to feed your snake when it is young is what it will continue to want to eat when it is older. 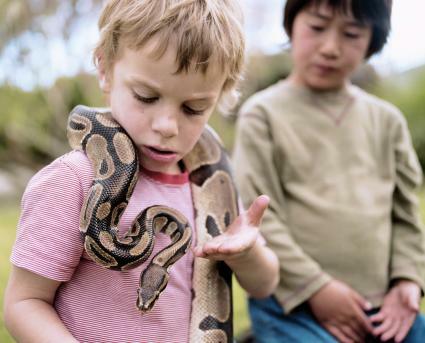 If you prefer to feed your snake live rodents, start him out on that while he is young. Otherwise, choose thawed out, frozen mice. Pet supply stores usually stock both types of rodents for snakes to eat. Ball pythons are naturally shy so you should allow your new pet to take some time to de-stress after you bring him to his new home. Give him a few days to feel comfortable in his new home. A good sign that the snake is feeling relaxed is if you see him eating. Then you can begin the first steps in handling him. Once you've fed him for the first time, allow a few more days to pass. He will be digesting his meal during this time. If he won't eat, he may still be stressed and needs more time to acclimate to his habitat. Make sure everything in the tank is set up for the most appropriate environment for your ball python and leave him alone for a few days and then see if he will eat. Don't attempt to handle him until he's eaten at least once. Once he's eaten, plan on handling a young snake no more than once a week and do so when you know he has digested his last meal completely. Mature snakes can be handled more often but always after his digestion is done. Some "don'ts" when handling a ball python is to never grab them by their tail or lift them by the head. You can take them out of a tank using a hook and your hands to support him. You can also use just your hands but always keep his body completely supported to keep him from becoming anxious and afraid and to prevent injury. The first time you pick him up, lift around the middle area of his body and make sure you support his body. Don't grasp him tightly or restrict his movement, especially his head. Another "don't" is coming from behind and lifting him. Your snake may become defensive when startled, so allow him to see you coming first. You also should not pick him up when he is shedding. Make sure you wash your hands before and after handling your snake. Ball pythons are often the first snake for a reptile lover because of their easy temperament. They are not known as biters unless they feel afraid and feel the need to defend themselves. Generally, though a ball python that is stressed will demonstrate where he gets his name from. They roll their bodies into a ball and hide their heads. These illnesses can be treated with medication, so always take your pet to a veterinarian that specializes in snakes. Ball pythons are amazing creatures, but snakes are not the right pets for everyone. Make sure you put in a good deal of time researching this snake and its needs as well as spending time handling one to make sure this is the pet for you. Keep in mind that you'll be making a commitment to care for this pet throughout its lifetime, so make sure you're prepared to do so.